This is the third year I've made nocino, and as long as I have access to my friend's tree full of green—immature—walnuts, I imagine I'll make it every year. The first year I made it, I followed to a T the directions a friend gave me. Months later, when I tasted the result, first I fell in love, and second I realized it had more citrus than necessary and it didn't need the cinnamon (blasphemy according to some Italians). So, last year, I tweaked the recipe a bit, cutting back the citrus, removing the cinnamon entirely, deepening with a few coffee beans and a whole vanilla bean. I was happy with the result and am making it the same way this year. But, who knows? Maybe next year I'll replace some of the vodka with brandy and the cloves with allspice. The tannic solidity of a green walnut invites curiosity. My friend who says to me, "Name your price for nocino," also says, "It tastes like Christmas." Another friend made a double batch last year to use in his version of Black Manhattans—his double batch didn't make it through a year. 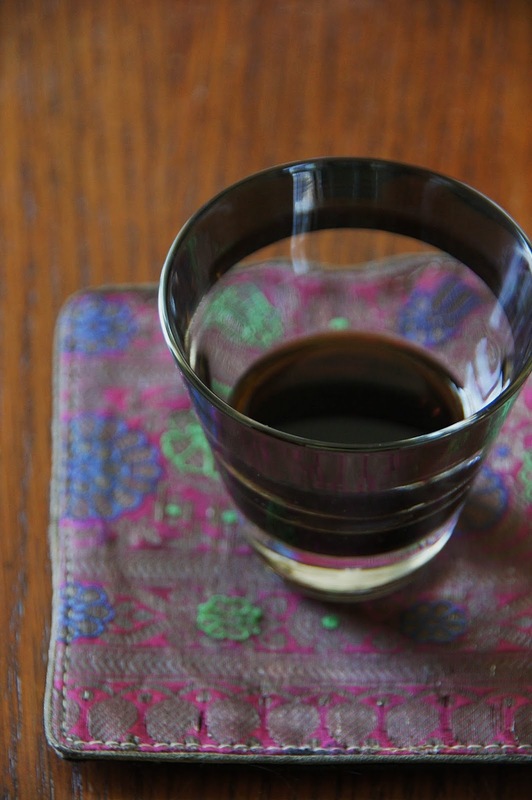 Nocino fits in the category of Italian digestifs called Amaro, which means "bitter." And it is bitter, but it's also silky, and rich, sweet, and oaky. It tastes like what Ents would drink at a party. I love it. Additionally, you'll need a very large jar, gloves, a sharp knife, and a cutting board you can stain without feeling bad about it. In your large jar, swirl together the first six ingredients. Wear those gloves, and working on the old cutting board, quarter the green skinned walnuts. You'll find the nutmeat inside is completely translucent, like an invisible, watery brain, and what will become the shell is pale and chalk-like. As you cut the walnuts, drop them into the vodka mixture. Once finished, swirl the ingredients together one more time, then seal the jar. Place the jar in your "experiment closet," which you probably have, because you're making this recipe in the first place. (Mine is a closet in our bedroom that contains many things for its small size, but mostly large jars in various stages of steeping sweet, aromatic, or both sweet and aromatic ingredients in alcohol bases.) Leave the jar there for eight or ten weeks, swirling it when you remember to do so. Over time, the sugar will dissolve and the tannins in the green walnuts will stain the liqueur deep brown-black. After the eight or ten weeks have passed, carefully strain the liqueur, first through a colander for the big chunks, then through clean fabric or a coffee filter to remove any other grit. Pour the strained mixture into a clean jar or bottle, and let it age in the "experiment closet" for another few months. Try it around Thanksgiving. Keep trying it at different ages. My goal is to keep a small bottle of each year for as long as I can, so when I sample the year's batch in the late fall, I can taste it in a flight of years, to see how age changes the product. I'm sure from year to year, I'll play with various aromatic ingredients, yet none of those tinkerings will weaken the dark, mysterious soul of this liqueur, a soul that centers on only two ingredients: green walnuts and time.